This Jack-Post Christmas Tree Stand is a large capacity tree stand for trees up to 10-feet tall and up to 6.75-inch trunk diameter. Made of plastic, this tree stands holds 1.5-gallons of water (without the tree), has a spill-catcher edge and is 21.5-inches in diameter. Stabilizing spike. Eye-bolts thread steel nuts for strength and smooth operation. Corrosion resistant 'gold tone' zinc-dichromate hardware. Made to last! 5-year limited warranty. 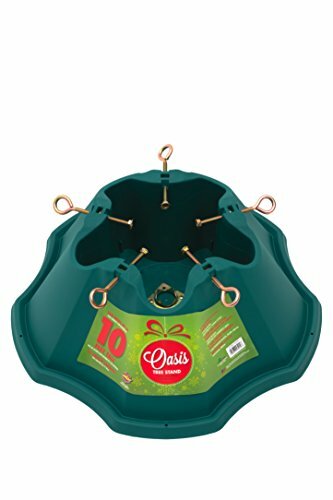 5-eye bolt 1.5-Gallon Plastic Christmas Tree Stand. Use for up to a 10-foot tree, 6.75-inch trunk and has an 21.5-inch base. 5-inch bare trunk needed. Steel spike base plate for added stability.